Been looking for the ideal cycling holiday in the south of France? Women’s cycling enthusiast Diane Best contacted me recently to tell me about her cycling tour company DBest Cycling that specialises in a cycling holiday in the south of France. I wondered how a Scottish native ends up running her own cycling tour company in France, especially when she got there via the long way – a stint in the TV industry in New York. So I asked Diane to share her story with us. I had been an avid squash player but about 10 years ago, after a series of injuries, I got more and more into cycling. I started on a hybrid bike doing laps in my local park and even did a few fairly easy going cycling holidays in France and Jordan. Eventually I got my first road bike and joined a local club – The New York Cycling Club (NYCC) – and tried some group rides. The club offers an amazing spring training program for all levels of cyclists with instruction on safe group riding and a series of rides that increase in speed and distance over a 8-12 week period. I did my first of those programs in 2015 and the next in 2016. I was totally hooked! Q: You’re originally from Scotland, then New York and now France. What took you on that path? What sort of accent do you have? Do you speak French? Yes, I was born and raised in Scotland. I did my BA in Scotland, followed by a Masters degree in the US. My professional life (television production) took me to New York where there were lots of opportunities in my line of work. I had been on a cycling holiday in France in 2004 when I discovered Correze. As I had some extra time, I decided to look at some real estate (more out of curiosity about French life in the countryside than anything else!) and that’s how I found the wonderful farmhouse, Le Bousquet. It took many years to renovate and I used it primarily as a vacation home. 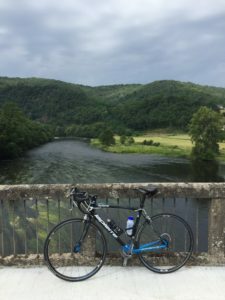 Around the time the renovation was complete, I was beginning to really get into cycling and often had friends come visit on cycling holidays – something I loved it so much I decided in 2016 to take the plunge and move permanently to France and start my cycling venture. I renovated the cottage on the property as my permanent home; invested in some high quality road bikes and created DBestCycling! I have a Scottish accent and a vocabulary peppered with a variety of American and New York-isms! I speak French (I learnt it at school which gave me a solid base for becoming more fluent here). Q: What compelled you to set up your own cycle tour company in the south of France on your own? Q: Tell me about your women’s training camps? I ran the first camp this year and it was a tremendous success. I invited a great coach I knew from New York – Tara Parsons – to provide cycling and skills training for intermediate women cyclists. The camp ran Saturday to Saturday and we had 5 group rides, three skills clinics and one rest day. The rides had a lot of variety, each with their own challenges – all with a certain amount of climbing (hard to avoid climbing in this region!) – with the highlight of the week being the ascent of the Puy Mary (1,589 m). In addition to cycling, the group had fun off the bike swimming at one of the nearby lakes; visiting a cheese factory; attending a concert at a local chateau; hanging out at a night market; and (possibly most importantly) enjoying some excellent dining! For example, an amazing Chef prepared a five-course dinner at the house; we went to a village barbecue with live music another night; and our Friday night Farewell Dinner & Prize Giving was at a fabulous local restaurant. A couple of the women knew each other before they arrived, but the rest met for the first time at the camp. It was quite a diverse group but everyone bonded really quickly – it soon felt like we were a team! Next year I plan to have three weeks of women’s camps by adding two weeks in September with a fantastic UK coach, Holly Seear. Q: What makes your tours different from other cycling holiday in the south of France? There are three very special components to my cycling tours – the location; the group size (limited to six) and the ability provide bespoke cycling weeks. Guests stay in the beautifully renovated and stylish farmhouse with exposed granite walls, original beams, oak floors and furnishings from a top French designer. There’s also a lovely garden with cherry, apple and pear trees where you can dine outdoors or just relax in a hammock! Whether you come on your own or with a group of friends or teammates, the small group size is a great way to meet new people and/or bond with friends/teammates and enjoy the camaraderie of like-minded travellers. I also offer groups bespoke cycling weeks that meets their needs. So whether you are a group of friends who want a relaxing holiday with some fun cycling adventures, or a race team who want to cycle every day and test your mettle with some local Cat 1 cyclists, or a group of triathletes who want to cycle, swim and run – I can plan a week that will work for you! With regard to the women’s cycling camps – there aren’t many cycling holidays run exclusively by women for other women. In that regard, I think I am quite unique. If you already cycle, ask a friend to join you on a ride! Post a ride on FaceBook and invite women in your community! Ask you local bike club what kind of programs they have available for women cyclists – if they don’t already have one, ask them to create one! This year I started a wee bike club in my village, Bassignac-le-Haut. With the help of the village town hall, I put up a Facebook invitation on our village website and placed flyers in our village noticeboard and nearby shops advertising a guided ride to the nearby market town of St. Privat for coffee. The ride is open to anyone of any age, with any kind of bike (pedal power or electric!). It’s advertised as being a non-competitive, fun and social and has been a great success! We ride at the pace of the slowest rider and nobody is ever left behind. Most of the participants are women and I think many of them didn’t really cycle before because they didn’t have anyone to ride with and they lacked confidence. In a group, there’s a lot of support and encouragement. I now have some riders joining from other villages! Don’t you just want to sign up for a cycling holiday in the south of France with Diane? Share your thoughts via comments or the Women Who Cycle Facebook page and while you’re there ‘like’ Diane’s page as well. Nice article! I have been on two DBest Cycling holidays and both were just fantastic. If you go, you won’t be disappointed!